Proprietary Name: Clean And Clear Dual Action Moisturizer What is the Proprietary Name? Non-Proprietary Name: Salicylic Acid What is the Non-Proprietary Name? 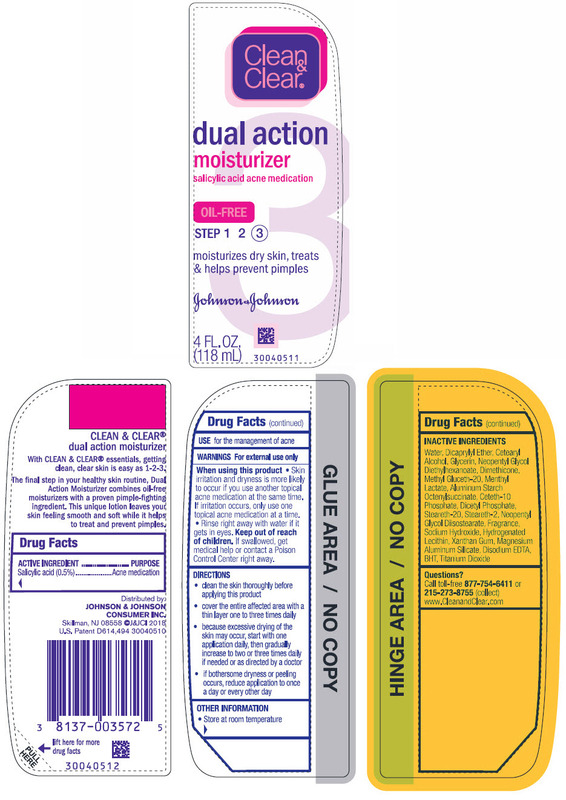 69968 - Johnson & Johnson Consumer Inc.
Clean And Clear Dual Action Moisturizer with NDC 69968-0589 is a a human over the counter drug product labeled by Johnson & Johnson Consumer Inc.. The generic name of Clean And Clear Dual Action Moisturizer is salicylic acid. The product's dosage form is lotion and is administered via topical form. Labeler Name: Johnson & Johnson Consumer Inc.
FDA Application Number: part333D What is the FDA Application Number? Skin irritation and dryness is more likely to occur if you use another topical acne medication at the same time. If irritation occurs, only use one topical acne medication at a time.Rinse right away with water if it gets in eyes. Cleanse skin thoroughly before applying this productcover the entire affected area with a thin layer one to three times dailybecause excessive drying of the skin may occur, start with one application daily, then gradually increase to two or three times daily if needed or as directed by a doctorif bothersome dryness or peeling occurs, reduce application to once a day or every other day.